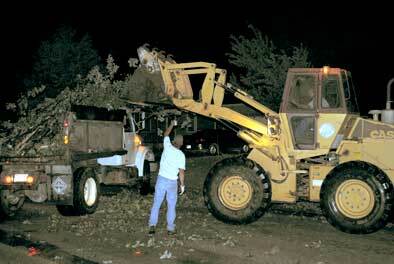 City workers clear a tree that was blocking the 100 block of South Cedar Street in Marion shortly before 1 a.m. Saturday. Daybreak revealed the full extent of the damage. 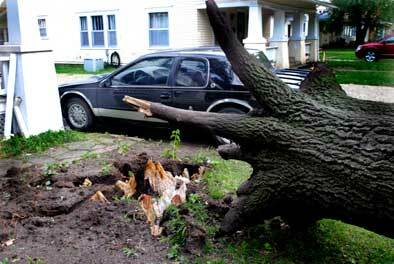 This tree, nearly eight feet around, was uprooted in the 300 block of Locust St. in Marion. A series of suddenly developing thunderstorms packing hurricane-force winds and hail up to 2 inches in diameter blasted through Marion County shortly after 10 p.m. Friday. No injuries were reported. However, the storms uprooted at least three large trees, split many others and blocked nearly a dozen streets with downed limbs and power lines in Marion and elsewhere in the county. The tin front of a building was reported torn off just east of the county line in Elmdale, and a train was reported derailed by high winds south of Cottonwood Falls. Residents began cleaning up their properties Saturday morning. Darrel Shults took a chain saw to help his grandmother, Doris Ford, cut up a tree that had fallen in her front yard at 417 S. Roosevelt St., Marion. “I slept right through it,” Ford said. Shults planned to go to Chase County when he was finished helping his grandmother, because a friend there had a tree fall in his yard. Power was out over the bulk of Marion County for two or more hours after the storms. In some limited areas, power was still out Saturday morning. “I still don’t have power” at 229 N. Lincoln St., Shults said about 9 a.m. Saturday. The first major storm entered the county near Goessel and tracked east-northeast to Marion. Winds with that storm were estimated at 70 to 100 mph as it approached from Inman to Moundridge. Spotters in Goessel estimated the wind speed there at 60 to 65 mph as the storm crossed into the county around 9:45 p.m. Even before the first storm reached the county, more than 200 campers at Marion Reservoir were relocated to shelters. As the first storm, weakened somewhat, hit Goessel, where a road was reported blocked with a downed sign at 10 p.m., a second and possibly more powerful storm was developing over Lost Springs and moving south-southwest, also toward Marion. Heavy rain, high winds and half-inch hail were reported at 10:05 p.m. in Lincolnville. National Weather Service radar indicated winds well in excess of 75 mph with that storm, especially over the just-evacuated Cottonwood Point and Marion Cove recreational areas at the reservoir. The storm hit Marion around 10:20 p.m., among other things activating smoke alarms at St. Luke Hospital and, soon afterward, apparently because of water flowing under a door, a burglar alarm at Central National Bank. Eastmoor United Methodist Church had been opened as a shelter by around 10:30 p.m., and reports of downed power lines arcing began rolling in around 10:35 p.m. before power failed altogether around 10:40 p.m.
For the most part the storm was over in Marion by 11:05 p.m.
Later, a third storm swept east across the southern tier of the county from Peabody to Florence and Burns. Other storms of a less severe nature rumbled through the county around 3 a.m. Almost immediately after the storm subsided in Marion, police, fire, and public works crews divided the city into quadrants, checking on residents, particularly the elderly, while patrolling streets looking for downed lines and roadways blocked by debris. By 1 a.m., numerous streets that had been blocked or nearly blocked were cleared by both front-loaders and manual efforts, and public works crews began the task of clearing limbs off power lines as power began being restored first to most of the hill and eventually to most of the valley and downtown area. A mature tree, broken off at the roots, continued to partially obstruct traffic Saturday morning in front of the home of Linda Alcorn, 311 Locust St., Marion. The tree was nearly 8 feet around at the base of its trunk. “I’m glad it missed my car,” Alcorn said. Although warnings were issued before the storms struck, no severe weather watch was in effect before the storms developed.